This exciting, non-violent game pits Timothy and Titus against a mysterious letter thief, whom they pursue through exciting biblical locations like Ephesus and Rome. The graphics are simply dazzling! Minimum system requirements: Windows 2000/XP, Pentium IV 1.5GHz, 256 MB RAM, 4 x CD-ROM drive, 64 MB Open GL, 1.2 compatible video card, 750 MB free hard disk space. 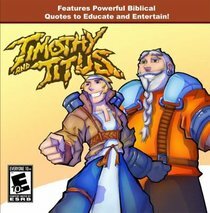 About "Timothy and Titus Game Win Cd-Rom Ages 10+"